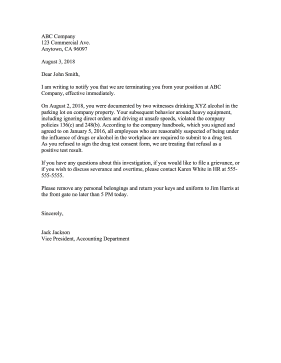 Perfect for sample language, this employee termination letter outlines why an employee is being fired for drug use. I am writing to notify you that we are terminating you from your position at ABC Company, effective immediately. On August 2, 2018, you were documented by two witnesses drinking XYZ alcohol in the parking lot on company property. Your subsequent behavior around heavy equipment, including ignoring direct orders and driving at unsafe speeds, violated the company policies 136(c) and 248(b). According to the company handbook, which you signed and agreed to on January 5, 2016, all employees who are reasonably suspected of being under the influence of drugs or alcohol in the workplace are required to submit to a drug test. As you refused to sign the drug test consent form, we are treating that refusal as a positive test result. If you have any questions about this investigation, if you would like to file a grievance, or if you wish to discuss severance and overtime, please contact Karen White in HR at 555-555-5555. Please remove any personal belongings and return your keys and uniform to Jim Harris at the front gate no later than 5 PM today.